Google runs an advertsing opportunity in the form of an auction called Adwords. 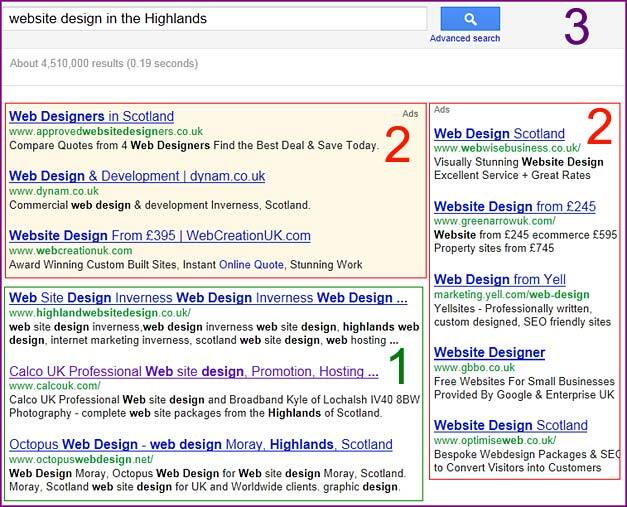 You will note that there is a hierarchy here with the top and best postion being in this case Web Designers in Scotland, on top of the normal or "organic" results marked with a large green 1. This company was chosen for the top slot because they were willing to pay more than everyone else bidding for the keywords WEB DESIGN HIGHLANDS. Whoever paid next most is listed second and so on. The cost per click therefore depends on competition. Calco UK have access to Google KEYWORD DATA so we know which keywords are typed into Google most frequently and will thus accurately trigger the most ads at the best price. We charge 149 pounds to open an account and set up your first advert and campaign. Set up and create a campaign : 149 pounds The price can include a "get started" voucher. You will need a credit or debit card. Call 0845 257 9460 and get started today. Campaign : a group of words, prices and criteria that will trigger your advert to be dispayed. CPA : Cost per acquisition The amount each conversion has cost.